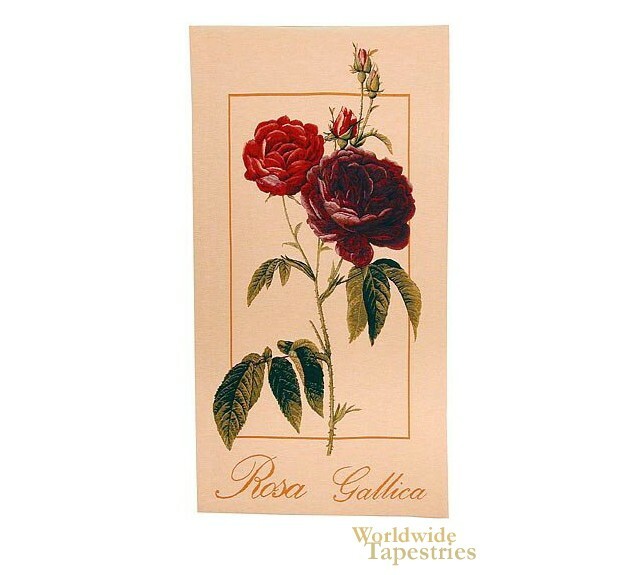 This tapestry of the French rose, or 'Rosa Gallica' depicts one of the earliest known cultivated species of the rose. This rose was said to have been grown since Roman and Greek times, and admired in medieval gardens. This tapestry shows its typically multiple, rounded leaves. Based on an artwork by Pierre-Joseph Redoute, this piece shows the purple-violet variation of this species. Redoute was a painter and botanist and his intimate knowledge and love of the rose is well illustrated here in this work. This tapestry is backed with lining and tunnel for easy hanging.